2 bedroom 1 bath fully furnished apartment in the heart of Old Town. 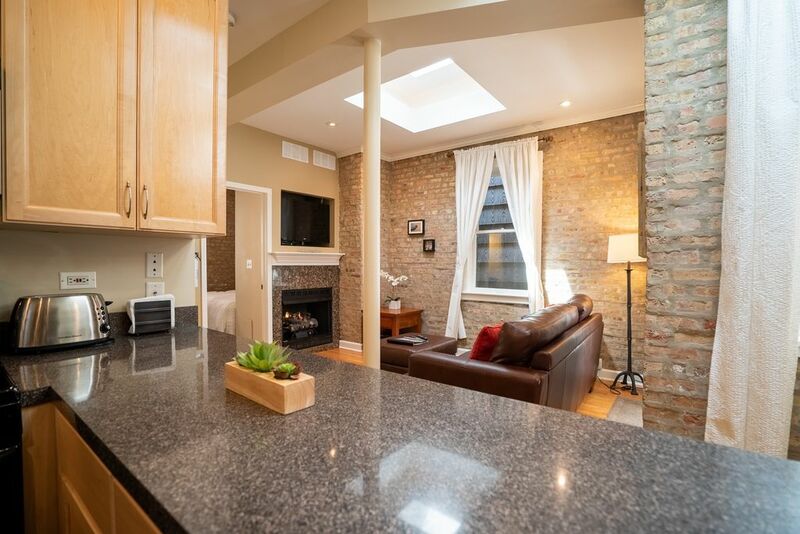 Whether you’re planning a weekend excursion, business trip or need a comfortable place to stay for family or friends, consider our newly rehabbed Guesthouse in Old Town a near north historical neighborhood in Chicago. Trendy Old Town offers boutique shopping and a variety of restaurants & bars. Approx 1.5 blocks from Sedgewick “ El” stop which will take you downtown to all attractions in 5-10 minutes. This beautiful apartment was in a perfect location for a visit to family members who live within blocks. I loved the layout and finishes, linens and toiletries, and the thoughtfully equipped kitchen. It was very easy to work with the property managers and I appreciated their speedy help with an issue that arose during my stay. Check-in and check-out were very easy. I hope to return again soon! The place was very comfortable and convenient to area events. We had a full slate of activities so stopping in and out was easy. The rooms were quiet and the beds cozy. Only thing I would add to improve is some smaller juice type glasses and a functioning fireplace or a notice in the web that it is not functioning. We were very happy! The location is great- close to Old Town’s shops and restaurants, Lincoln Park and the L. One of the guests ran the Chicago Marathon. Although the location is not near the start/ finish, it was the perfect location to watch the Chicago Marathon. It was a short walk to mile 5 and mile 11. The apartment easily and comfortably accommodated 4 adults. we were in town to visit our daughters during Labor Day weekend. great location, easy to get around town. We recently stayed here while attending a convention. We had 3 men and it worked OK for us but would be great for a small family or couple. It is relatively small but they make great use of the space. Having just one bathroom could be an issue for some. It was fine for us but we are all 50 something men. It was well stocked with the necessities including good towels and linens. The beds were reasonably comfortable. The TV and cable are good and all you really need since you shouldn't be hanging out there when there is so much to do around you. We struggled with the thermostat but eventually figured it out. Maybe its time to go with something like a Nest that makes a little more intrinsic sense. We had one guy who wanted a bigger toilet but he spent too much time in there anyway. The internet seemed slow but we didn't really need it. The location is great and being a BBQ guy, the ribs across the street at the Twin Anchors were some of the best I have ever had. Its easy walking distance to all Lincoln Park has to offer and then some. Hailing Ubers to get around was also very easy and its a short ride to most everything you are going to want to do. I spend a lot of time in Chicago and mostly stay downtown but this will be added to the list. All weekends require a 3, 4, 5 or 6 night minimum. Please ask about your specific dates. Also, please ask us about our Winter Special in January & February! We do allow 1-2 nights stays Monday-Thursday with a cleaning fee. Restrictions do get lifted and gaps will be filled so please ask about your specific dates.